I'm going to start off Blogmas with a small Lush giveaway, I actually have 2 small sets to giveaway but for ease I'm going to break them up. Giveaway opens 1/12/2014 at 8:30 am and closes 8/12/2014 at 12 midnight. 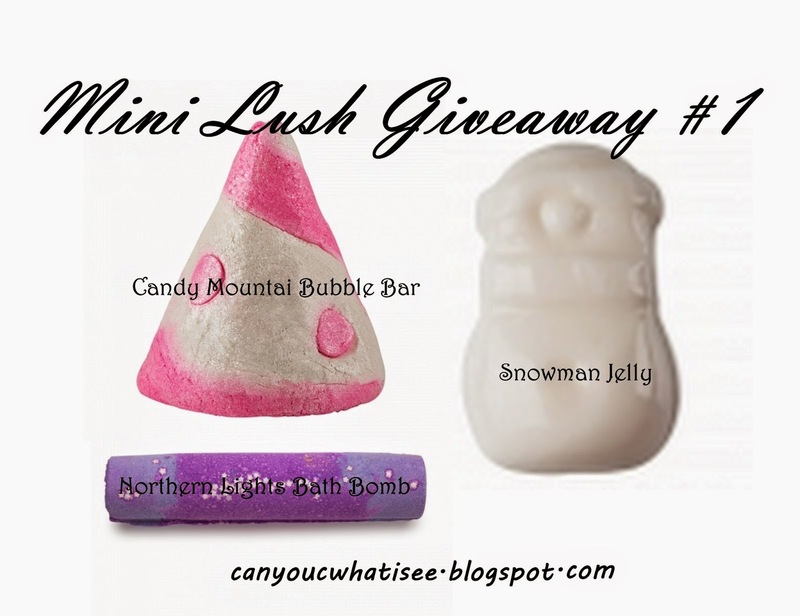 13 comments on "Blogmas - Giveaway #1 - Closed"
My favourite product from Lush that I'd recommend is their Lip Scrubs! I love the Bubblegum variety because it works so well and smells amazing! Every time I go to Lush I look at the lip scrubs but I never take the plunge! I think it's about time that I give them a go. I have a lot of faith in your judgement and just know these Blogmas prizes are gonna be EPIC, thank you for your generosity!! Unfortunately I'm not allowed to have baths because of water wastage (mother's a bit of a hypocrite though as she leaves the water running all the time when washing dishes) but these Lush bath products are adorable - love their names too. I wanna try some Lush skincare, all I've tried are their body washes - Snow Fairy (sickly sweet, got sick of it) and Ponche which smells alcoholic - love it, I don't drink alcohol but Ponche has a lot of orange in it too. Mhmmmm. Oh and their solid perfumes ROCK - I have lust and it smells so strongly of jasmine tea I adore it. I had no idea they did solid perfumes!! I'll definitely have to check those out! I also don't really have baths but it's due to a plumbing problem, I think we have a broken pipe because the bath water runs a muddy colour and I'm just not keen on bathing in something that looks brown ha! I recommend you try Lush Sugar Scrub, it is amazing! Ive only tried one product from lush and thats the bubblegum lip scrub, i definitely recommend it! I cant really make any recommendations as Ive only ever tried a lush soap. I cant remember what one it was but it smelt amazing and the scent filled the entire bathroom for weeks. I purchased my first Lush soap recently, Egg Nog..I don't even like soap bars but the scent of it was just too good to pass up! If you love sweet scents I recommend spacegirl bath bomb. It smells amazing!